Levitate is a visually refined system, which in combination with its added functionality sets it apart from alternatives available on the market. Levitate provides a complete solution with the following advantages.Intuitive Height Adjustment The monitor height is adjusted via a unique thumb activated lever, allowing the same hand to support the weight of the monitor. Full Range Of Motion The dual articulated arm combined with the pivoting and tilting head provide a complete range of motion to meet the most stringent ergonomic standards. Multiple Arm Capacity Each post can house up to 4 monitors at a single level. Additional monitors are accommodated by simply adding a additional arm component, with no jointing knuckles required. This simplifies facilities management and provides greater flexibility over the life of the product. Low Profile Post The 400mm high Levitate post is sufficient to provide the required height adjustment range (to meet standards) due to the incline on the arm itself. This means the post will not protrude above the screen line in a typical 1200mm high open plan environment. Quick Release Mount As Standard A quick release mount with locking lever is provided as standard. 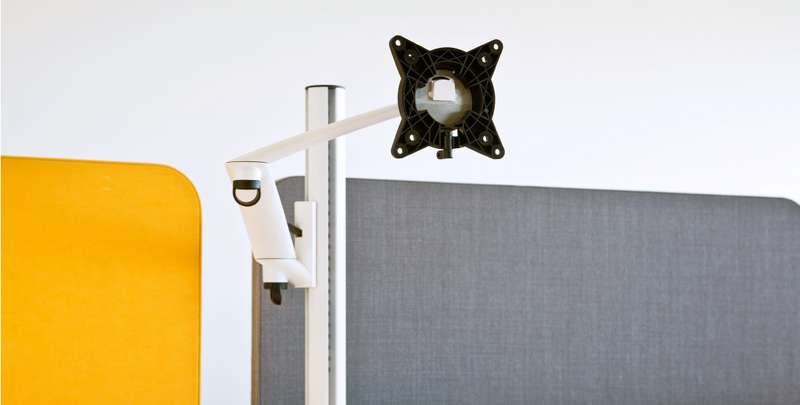 This facilitates fast swapping in and out for the IT team.Rotating Screen - Landscape To PortraitThe Levitate Arm incorporates a swivelling head, enabling the screen to be rotated by hand through 90 degrees, from landscape to portrait orientation. Cable Management Levitate incorporates cable management clips, ensuring leads are kept tidy.